"The relationship between the father bluebird and his family is special. As a bluebird lover, nature artist, and past president of the NC Bluebird Society, I have studied at great length how the male bluebird cares for his family. While the female is on the nest, Papa Blue is constantly flying back and forth with food for his mate. I am always amazed to watch him fly to the box at breakneck speed, land softly on both feet, enter the box half way, feed his mate, and never disturb the nest." "'Cleared for Landing' portrays a male bluebird on a final approach to a landing with a meal worm in his mouth. 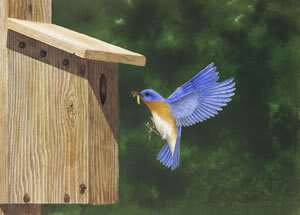 I hope this painting will encourage you to put up a bluebird box so that you also can have the wonderful experience of watching the blues raise their family right in your own back yard." Look for the hidden hummingbird in the knot on the side of the bird box.